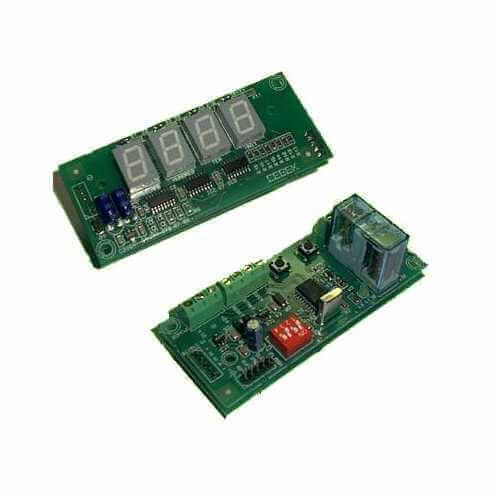 Programmable timer module for coin mechanism operated machines (e.g. tumble dryers, TV's, tanning beds, arcade games, etc.). Control board with mains rated relay output and separate 0.5" LED 4-digit display board. Quartz crystal for accuracy. On-board buttons are used to select the time block period from 1 - 9,999 seconds or 1 - 9,999 minutes. The maximum time that the coin mechanism can set the board to is 9,999. When the module receives a signal pulse from the coin mechanism (not included) the relay activates and the preset time starts counting down on the display. Inserting more coins adds further blocks of the same preset time period and the remaining time displayed is updated accordingly. When the countdown reaches zero the relay turns off and the unit awaits further coins. The coin/token mechanism is not included and simple needs to provide a volt-free contact closure to the boards Time input of around 50mS duration. A simple push button can also be used instead to activate the board. A Reset input allow you to stop the timing period at any time and returns module to zero, waiting for a new activation.